I’m back and have more or less recuperated from the most amazing, memorable and (These days most people take this word lightly, but still…) EPIC European Adventure! Before diving into the details of the trip, let me apologize to everyone for not being able to update my blog as I journeyed. Yes… Europe was THAT good. So much so, that I couldn’t concentrate on blogging as I went. The experience was just too intense! So, here’s what we did. There were three of us who trekked across the Old World. My good friend, Never Winter Again (NWA) along with Pizzarol (Code name explained later), who is NWA’s former co-worker that I have come to call a good friend as well. The thing about our grand endeavour (I’ve been to England now and have every right to spell ‘endeavour’ with a ‘u’ 😛 ) is that the only plans we had made was to get in and out of Europe. A flight into Heathrow Airport in London and a returning flight to the U.S. from Arlanda, near Stockholm were the only two things that were set in stone. Everything in between, we decided, would be figured out as we were confronted with it. That probably makes some people cringe, but we wanted this kind of uncertainty to add excitement to our undertaking. From the Netherlands, we journeyed southwards to lovely Paris, where we took on a more cultural tone. After staying in our Five Star Opel, we drove it to San Sebastian, Spain to meet NWA’s aunt. Then, it was back across the Pyrenees and onward to Monaco and Italy. Charming Pisa and Ancient Rome where our hosts in the Italian Peninsula and afterwards we cut through the Austrian Alps towards Germany. Ahhhh… Deutschland, where I have made many good memories and many more good friends. Setting this as our home base, we struck out towards Karlovy Vary and Prague in the Czech Republic to meet and make new friends and to Switzerland and Liechtenstein afterwards. Lastly, we flew off to lonely Stockholm and spent our remaining two days there before reluctantly returning to the US. In the coming days, I shall regale you with the tales of our various experiences. Right now though… I really want to update something I’ve been meaning to update for a while now. 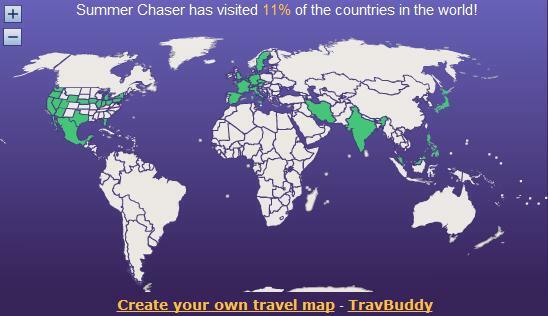 Last we saw the Travbuddy map, I was at a measly 4% of the World Seen. I am quite glad to have more than doubled that. I’ve got an amazing trip to Europe planned out that they’ll sing about in ballads… and it’s only 23 days away! Never having been on that continent, I don’t really know what to expect other than what I’ve read about. What I do know is that once this trip is under my belt, I’ll be at three continents down with four to go! The voyage will commence in jolly good ol’ England and finish in the “Venice of the North”, the global city of Stockholm; whilst everything in between will be completely flexible. TOURIST TIPS: If you wish to try something like this, be sure to apply for an International Driver’s License. It’s really easy to apply for one and you’ll get it in a matter of days. Next stop, the Iberian Peninsula to meet some relatives. Then, we’ll cut across France towards the former City-States in Italy: Rome, Venice, Milan, Pisa among others… I expect we’ll spend a lot of time here as there is (relatively) a lot more to see, smell, hear and taste. Just the thought of spaghetti, pizza, and lasagna is making my appetite file a complaint for not flying there right now. And then, we go North to Switzerland and Germany. I’m excited to meet an old friend I haven’t seen in more than a decade. She and I will have to set aside some time to catch up on everything that’s gone on. This leg of the journey will be really interesting for me. Have any of you seen the movie A Fish Called Wanda? Remember the effect the Italian or the Russian language had on Jamie Lee Curtis’ character? Well… for whatever reason German has a similar effect on me, though perhaps a little less… dramatic. Heh, I can’t really explain why or how this came to be. It simply is, but like I said, it will be really interesting. If there’s still time after all that, I hope to see more of Eastern Europe. I’d like to see Poland and the Czech Republic specifically. We’ll be meeting more friends to show us around town. I’ll have to check with the rest of the group, but I do believe we’ll be at a wine and cheese tasting event. TOURIST TIP: Traveling with a group minimizes the likelihood of being victimized by criminals. Not to mention being able to save some money by pooling resources and splitting costs. So, find some people you trust and start planning a trip! Last but hardly least, we’ll be in Scandinavia and hopefully it won’t be too cold. We all know by now how wind chill and I get along, right? The Scandinavian nations are said to have the happiest and most content people people in the world. Their fairly liberal and progressive society is advanced in many ways, quite possibly the closest thing to most people’s idea of a Utopia. This trip is going to be so awesome that I don’t know if I’ll be able to sleep in the coming weeks! I keep thinking about all the stuff I can start crossing off the bucket list. It should also significantly raise the percentage of the world I’ve already seen. 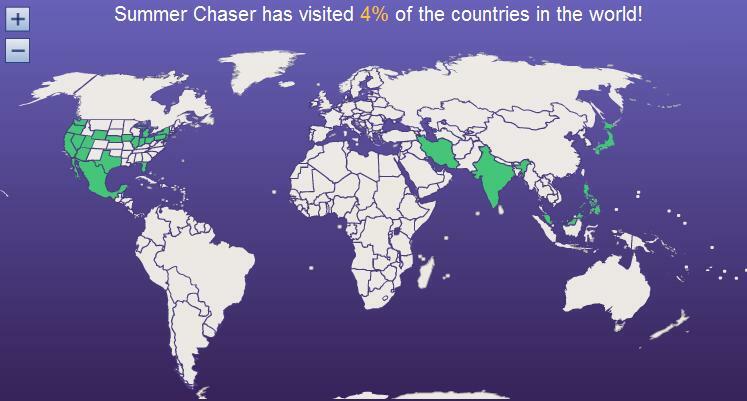 I’ll be posting my wishlist for this trip soon along with some recommended souvenirs from each country. Stay tuned!